By Dan Ambrose: WBC heavyweight champion Vitali Klitschko (42-2, 39 KO’s) is no longer even trying to disguise the fact that his fight against Poland’s Tomasz Adamek (44-1, 28 KO’s) on September 10th is a huge mismatch of epic proportions. Up until now, Vitali has been very respectful of Adamek, not slamming him and telling the world how out of his class Adamek is. 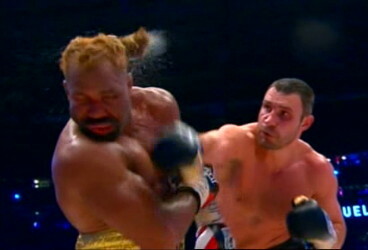 But now Vitali is no longer playing nice and is giving the straight and honest truth about this mismatch. Speaking with fightnews.com, Vitali said “I don’t think the police will let him [Adamek] bring a gun. Maybe a baseball bat? No, not even this can help him.” Vitali is speaking the truth. Adamek has no chance in this fight and is basically a light hitting cruiserweight who has is going to get destroyed no matter what he does. Adamek used to be a slugger at light heavyweight and cruiserweight, but now he’s more of a hit and run fighter in the Chris Byrd mode. He’s not nearly as good at picking off punches as Byrd, though, and is going to really take a pounding from Vitali unless Adamek just figures to lose by running without really fighting. That’s a distinct possibly I hate to say. In his recent sparring with Fres Oquendo, Vital worked a lot on his defensive game, dodging shots and making Fres hit a lot of air. He looked very good. This is just a part of Vitali’s game. I can’t see him focusing on defense too much because he probably won’t have to because Adamek will be running. It’s going to come down to Vitali having to chase Adamek around the ring or else there won’t be a fight.